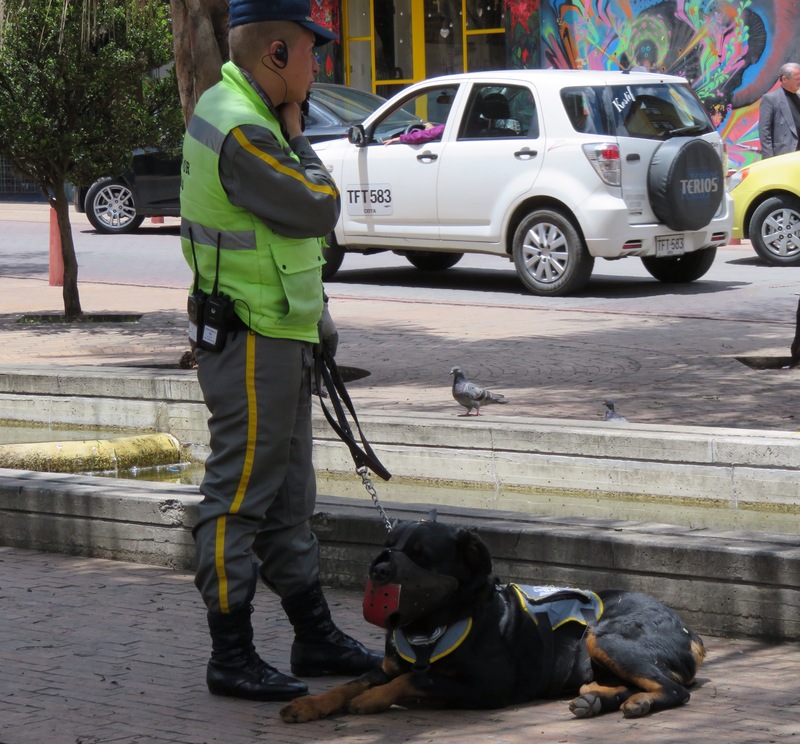 Our first stop on our three month trip through Colombia and Central America was Bogota, Colombia. Bogota is a huge city nestled in the Andean Mountains and sits at around 2,800 meters above sea level. The altitude is enough to leave you feeling a little breathless but for me, it was no where near as much of a problem as it was in places much higher such as Cuzco, Peru or La Paz, Bolivia. Coming from my beautiful little mountain town in British Colombia, where it’s so quiet and the air is pure, it was a bit of a shock at first coming to such a loud, busy, bustling city that’s full of pollution from the traffic. We stayed at an Australian owned hostel called the Cranky croc in the La Candelaria district which is Bogota’s oldest and most historic district. It is said that a few years ago this was a very unsafe district to be in but now with the police presence increased, it is much safer (it’s quite unsafe at night still). 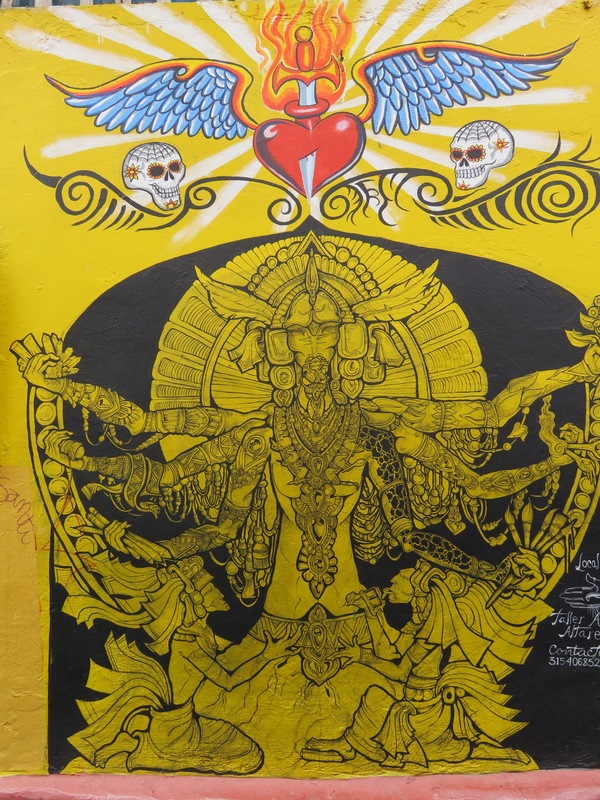 It’s filled with cobble stoned streets, colourful buildings and some cool street art. 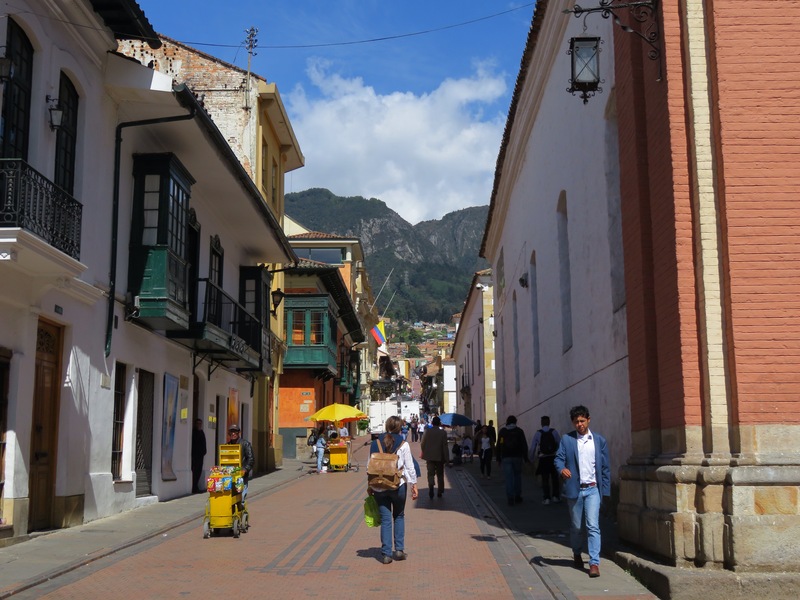 We stayed in Bogota for 3 nights which was more than enough for us. We found that there wasn’t much of interest here for us. One thing that every guide book tells you to do here is visit the Museo de Oro (Gold Museum) which costs 3,000 COP ($1.60 Aus) to enter. 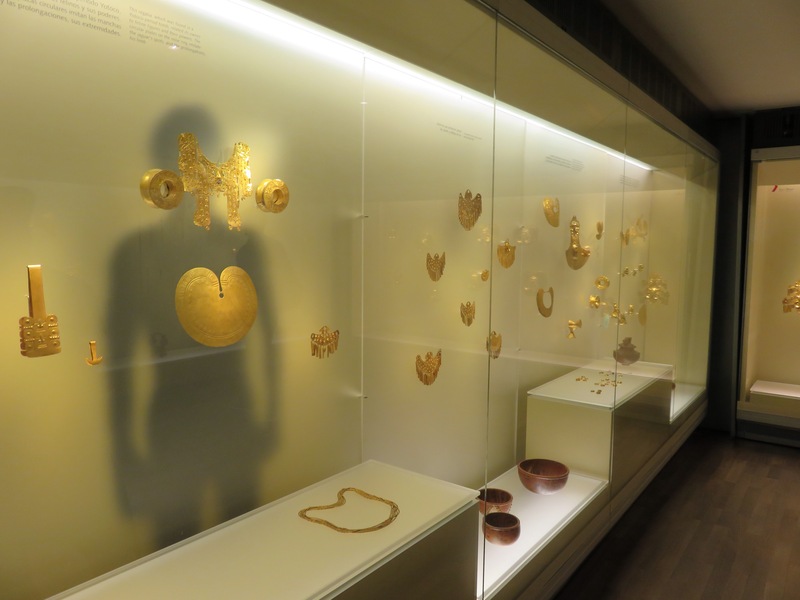 The museum displays the worlds biggest collection of pre Hispanic gold work. It consists of three floors filled with glass cases of artefacts. In the glass cases, it displays the work of goldsmiths from different cultures who inhabited Colombia before the Spanish people arrived. All the descriptions are in English as well as Spanish and it is truely fascinating. I would definitely recommend checking it out if you ever find yourself in Bogota. The other thing that was ‘top of my list’ to do in Bogota was take the cable car up Cerro Monesratte- A huge mountain that looms over the city and reaches an altitude of 3,152 meters above sea level. There is a church at the top which was built in the 17th century as well as restaurants and of course a magnificent view of the city. The hill is a pilgrim destination as well as a tourist destination. 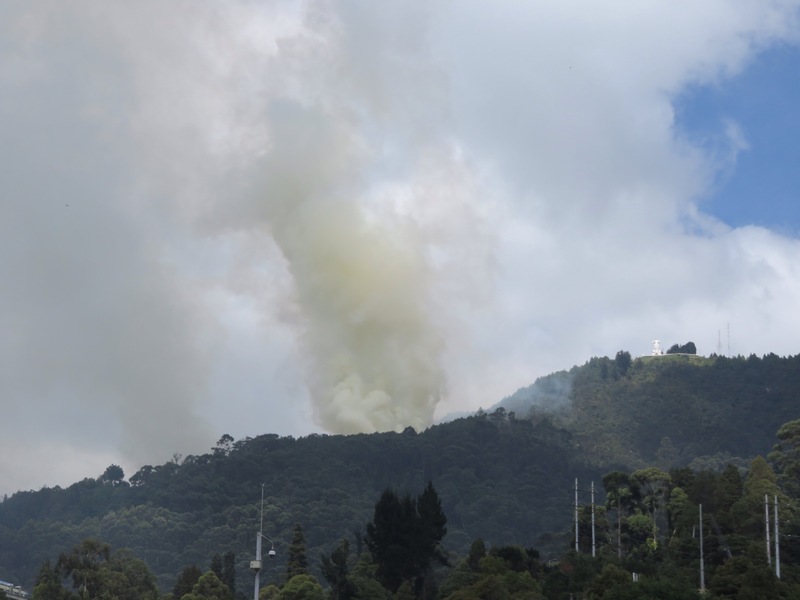 Unluckily for us, the day we went to go up there was a huge fire on top of the mountain next to it which was covering Cerro Monserrate and the whole city in smoke. There would be no magnificent view for us. If you are ever in Bogota, check it out. It’s a shame we didn’t get to. We filled our days wandering the streets of La Candelaria, eating Nutella crepes, drinking coffee and taking lots of photos of the old buildings. Did I feel safe? Yes and no. No, because of things I’ve read and because of how many police there is with massive riffles or Rottweilers in tow and yes, because everyone was super friendly, we had no troubles and because I knew the police were always there. Next up, we are off to the famous Zona Cafetera (coffee region) to stay in a beautiful town on an organic farm. I can’t wait, This city has me missing nature already!